Reading Timothy Carney's opinion article - I would like to highlight the word opinion - for the New York Times was very, let's say, interesting. I'm going to start off by stating the obvious but it sometimes isn't said. Fox News is a conservative outlet and MSNBC is a liberal outlet. There's no denying that and we do ourselves a disservice when we begrudge the fact that these networks have an agenda to push. They've been like that for years and there isn't an end in sight, until the more than likely fall of the 24 hour news networks as they are now. Now with that being said, let's take a look at the so called "liberal" media that Carney says is running rampant. For 10 years in a row, Fox News was the most viewed of the three major cable networks. Having more than 3x the viewers of CNN and MSNBC separately. Looking at that, how could the TV media's most viewed network - by a landslide - be conservative, but yet have a liberal agenda? My answer to that question would be a confused sounding, "I don't know," with an upside-down smiling emoji. But that is TV media. Carney was mostly arguing that print media like the New York Times and the Washington Post are supporting the liberal agenda. Which I agree, because they are more left-of-center. But that doesn't take away from the fact that there are right-of-center outlets as well. The people who actually take time out of their day to read a whole article already have their minds made up. They know if they're conservative or liberal, and one article they read is not going to change their mind. In fact, if a liberal is reading an article and they have a feeling it's conservative, they'll just stop reading and find something else that will appease their political appetite. So if we are talking about actually molding minds and leading the public a certain way, print media does not do that. The medium that actually yields that power is TV. 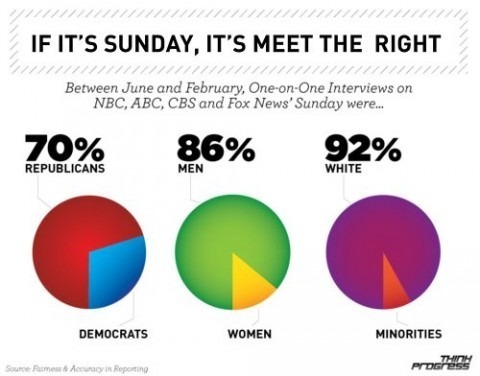 Which brings us back to Fox News having more viewers than CNN and MSNBC combined. I feel it's important to have an understanding of what is liberal and what, in today's day and age, is normal. Carney brought up a point about abortion stating, "'property rights' gets put in scare quotes, while 'abortion rights' doesn't." As if the media wants to make abortion rights a law. Oh wait, it is a law. The Supreme Court decided in a little case called Roe v. Wade that a woman has a right to choose. In 1973! It has been 42 years and we are still talking about it. To me, 42 years would qualify something as the norm. So being in favor of a woman's right to choose isn't being liberal or being progressive, it's obeying the law. In fact, it's being conservative. Not wanting a change in the way something is the basic foundation of conservatism. So how could one even argue that supporting abortion rights is liberal? Wanting the law to change is liberal and progressive. It may hurt some conservatives to say this, but what Kim Davis did was the exact definition of progressive. With all of that said, what was liberal and progressive 10 to 20 years ago is not anymore. It is normal. The world has changed - notice how I used the past tense of change. The number of educated people is rising while the number of people associating themselves with a religion is dropping. The majority of millennials are liberal and the majority of people with a college degree identify themselves as liberal. So the idea of a liberal media baffles me. If the media was truly "liberal" and not "normal," Bernie Sanders would have been President by now - now he's liberal. If the media was truly liberal, we would not have entered into Iraq in 2003. If the media was truly liberal, it would not have taken until 2015 for a gay couple to finally have the basic right to marry who they love. If the media was truly liberal, it wouldn't have taken this long to give everyone the opportunity to have all-access healthcare and the passing of comprehensive gun-control would be a thing of the past. So before we throw around the words "liberal media," let's at least consider the idea that having one might indeed be a good thing as it forces the government to actually get things done.